A separation agreement can be an attractive option for couples that do not want to divorce. 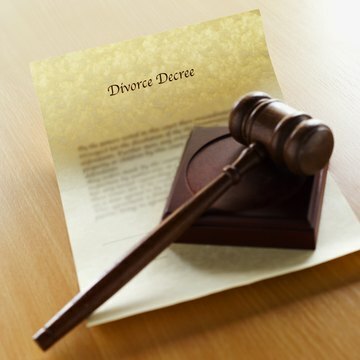 Whereas a divorce results in a court judgment, a settlement agreement is a private contract entered into by the couple. As with a judgment, a settlement agreement is enforceable in court. Separation agreements usually begin by stating the basic facts underlying your agreement. The specific provisions of your agreement set forth the details of your separation, and usually form the main body of the agreement. The last section of the agreement is usually reserved for more generalized provisions. Prepare your separation agreement on plain, unlined paper, rather than on pleading paper. Pleading paper is a type of paper used by attorneys when submitting documents to a court, and features a vertical line and numbers along the left side of the paper. You may use pleading paper if you choose, but it is not necessary. Write each provision of the separation agreement within its own paragraph. Write an identifying number to the left of the first line of each paragraph to allow for easy referencing should the need arise. Write your name and the name of your spouse, and identify the two of you as the parties to the separation agreement. Write the date and place where you were married, and the date of separation. Write the names and birthdates of any children that you have together. Include a statement explaining why you are separating. The statement may include specific details, but you may instead choose to state only that irreconcilable differences have arisen. Include language that reveals your motivation for entering into a separation agreement, such as to provide an amicable means of separating your assets and liabilities, and making mutually agreeable decisions regarding your children. Specify the marital property that you will keep or use after your separation, as well as that property your spouse will receive. Include the arrangement you agree to concerning matters of child custody and visitation, if applicable. State whether either of you will pay child support or spousal support. You should include when the payments are due, and how those payments will be made. Include information regarding the income and expenses for each of you, and whether each of you anticipates a significant change of income or expense in the near future if either of you has agreed to pay child or spousal support. Examples include a new job, a promotion, an anticipated job loss, an increase in mortgage payment amount, or payments attributable to a car you are expecting to purchase soon. Include language specifying who is responsible for attorney’s fees should the need for an attorney arise. You may decide that a spouse is only responsible for that spouse’s attorney’s fees, or that one spouse will be responsible for the attorney’s fees of both spouses. Include language that releases each spouse from any claims against the other spouse, and from any claims the other spouse may have against someone, if you so choose. State that the laws of the state in which you currently live will govern the agreement if court action arises. This language can be extremely important if one spouse later moves to a remote state and argues that that state’s laws should apply, particularly if that state’s laws are more favorable to that spouse than the laws of the state in which you entered into the agreement. Include a provision that a spouse who files for bankruptcy agrees to notify the other spouse of the bankruptcy filing within a certain period of time, such as 10 days, to give the nonfiling spouse the opportunity to contest the discharge of marital debts in bankruptcy. If one spouse’s obligation to pay a marital debt is discharged in bankruptcy, the nonfiling spouse may be responsible to the creditor for the entire obligation. A property settlement agreement is one of those legal documents that goes by different names in different jurisdictions. Depending on where you live, your state might call it a marital settlement agreement, separation agreement or something else entirely. By any name, it can include provisions for custody of your children, but in some states, you might have to file a separate document to address this issue in addition to the property division and support aspects of your divorce. In all states, a settlement agreement is a document that can finalize the end of your marriage.